the induced shear forces and moments along the suspended pipe/cable. 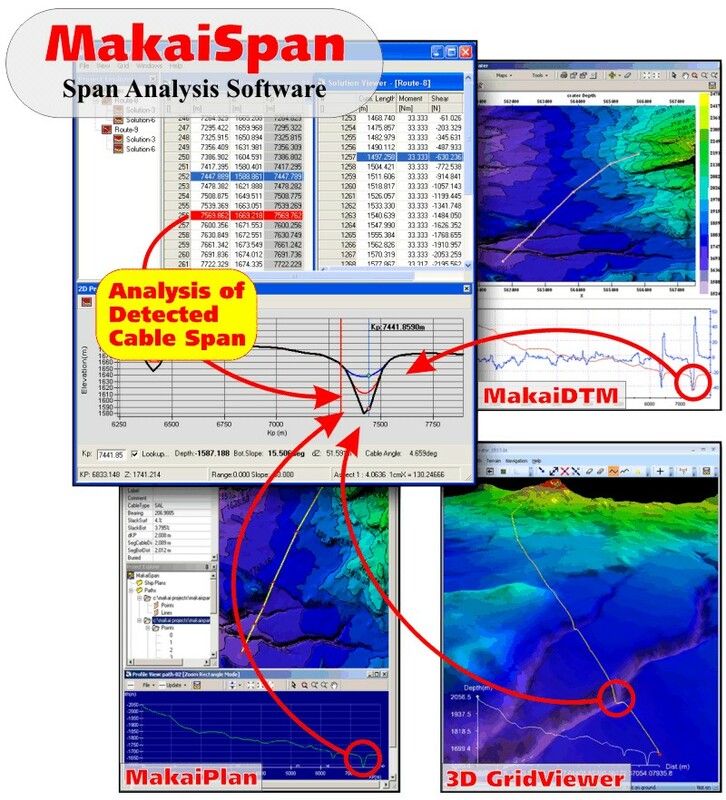 Running on a Microsoft Windows platform, the main computational engine uses bathymetry profiles together with the physical properties of the pipe/cable and the applied horizontal tension, in order to obtain a solution of the pipeline/cable shape along the seafloor. Results are displayed graphically in a 2D view and can be viewed in tabular form as well. Seabed profile data is read from 2D (X,Z) or 3D (X,Y,Z) ASCII data files containing the spatial coordinates and water depth along a specific route. Each profile (track) is automatically assigned an editable route name in the project explorer window. The seabed profile is viewed and it can be edited in the Route Editor window (shown in the figure to the right). A 2D Profile Viewer window showing depth vs. distance along the selected Route is shown at the bottom of the screen (selected route is shown as a black line in figure below). Multiple solutions can be shown simultaneously and each solution can be presented with different line types and colors. Sections of cable/pipe where the length of the spans exceeds the critical span length, defined by the user, are highlighted in red in the Solution Viewer window, (see figure above) and by vertical red lines in the profile viewer window (see figure below). The same applies if the bend radius is smaller than the critical value of bend radius defined by the user. In the figure above, the 2D Profile Viewer shows the route, in black, and two different solutions obtained along the primary route. Both solutions analyze the same cable with the only difference being that the solution in red has a horizontal tension equal to half of that used to obtain the solution in blue. The Kp marker (shown above as a vertical blue line with associated distance) can be used to scroll along the solutions and obtain specific information regarding any point along the suspended pipe/cable. These data are shown in the information bar at the bottom of the window. The Kp marker is also linked to the Route Editor window and to the Solution Viewer window. As the Kp is moved along the profile window (by clicking and dragging the mouse), the Solution and Route Editor windows automatically scroll to the specific Kp row allowing the user to focus on problem areas. and can easily integrate with third-party software applications (contact makai).